Learn how to make your very own printed circuit board (PCB) in this workshop run by Dr. Matt Little on Thursday, 17 October. In this workshop, you’ll learn the photo-resist and ferric-chloride etching process for making printed circuit boards to make a breakout board for converting old ATX power supplies into useful power supplies for future projects. 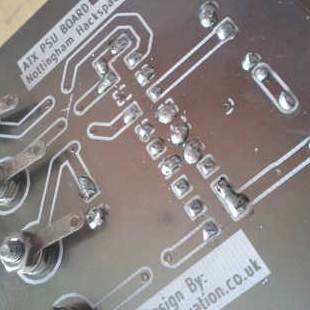 The workshop includes all components and training, using equipment available at the hackspace so that you can use the same equipment in the future to make your own circuit boards. Running from 7:30 – 9:30, the workshop costs £10 and tickets are available now.